Recent Year 12 graduate Seb Liddle began working for Goolarri Media during Year 11 in a ‘roadie’ type role for one of their productions. This experience, coupled with his enthusiasm and networking, led to other doors opening very rapidly. He was soon receiving paid employment for sound and light and event companies linking well with his Music Certificate III course at school, which ultimately gave him the skills to obtain a part-time AV Tech role with the Shire of Broome Civic Centre. Seb has also been tutoring in Year 8 Music all year. Such quick and determined career development is a rare thing and led to being nominated for the SCSA VET Awards in the Music Industry category. His written application and resume were outstanding as they accurately reflected his amazing progress in the industry. He also received great references from employers. As a result of this, Seb was shortlisted as a finalist and recently completed an interview with the SCSA panel in Perth. 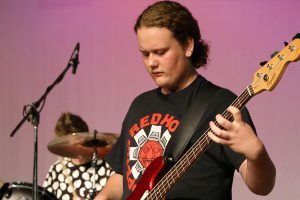 Seb is in line to receive a VET Award of Excellence, however, if deemed to be the outright winner of his category, he may receive the VET Exhibition for Music, the top award in the state for Year 12 VET Music students. The recipients of the Exhibitions from each industry are then in the running to be named as the Beazley Medalist for VET, the highest individual honour. Congratulations and best of luck, Seb.